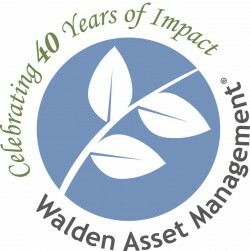 Walden Asset Management has provided portfolio management services to socially responsible investors since 1975. As the oldest institutional investment manager in the sustainable and responsible investment (SRI) industry, Walden has unparalleled experience managing portfolios for clients who seek wise stewardship of their assets as well as social and environmental impact through their investments. Our team of dedicated investment professionals has developed and implemented a consistent and disciplined investment philosophy and process across a wide variety of investment strategies to suit our clients' risk/return and environmental and social objectives. We specialize in delivering competitive returns with less risk as well as providing attentive and personalized service. Walden is the socially responsive investment practice of Boston Trust & Investment Management Company, an employee-owned investment management company. Walden represents approximately 35% of firm assets under management. Boston Trust and Walden share the same investment team and staff, philosophy, and approach. Walden also advocates for improved corporate policies and practices on behalf of clients through shareholder engagement strategies and public policy advocacy. Walden is the SRI practice of Boston Trust & Investment Management Company, an employee-owned investment management company. Walden represents approximately 35% of firm assets under management. Boston Trust and Walden share the same investment team and staff, philosophy, and approach. Walden also advocates for improved corporate policies and practices on behalf of clients through shareholder engagement strategies and public policy advocacy. All of our staff and operations are located at One Beacon Street, at the top of historic Beacon Hill in Boston.